If you have a watch that won’t tick, it might need a new battery. The actual process of replacing it is very simple, but there are several things you need to know to find the right watch battery replacement. First, you need to know that only watches with the word “Quartz” in it are battery operated. If yours has a mechanical movement, then a battery isn’t required at all. Want Our Centennial Expert To Take Care Of Your Watch Battery Replacement? While figuring out exactly what battery your watch needs can seem difficult there are really four steps you need to take to figure it out. Simply take a look at the back of the watch. Often times you can find the battery type, albeit in a very small font. If that doesn’t work, turn to your owner manual if you still have it. Next, you can try turning to the internet and search for your specific model number. If none of those work. 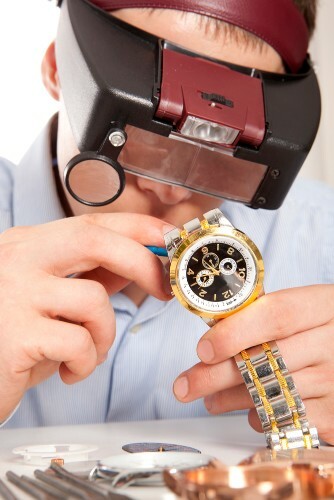 you can stop by Mauzie’s Fine Jewelry and have our expert watchmaker help you figure out what batteries you need. Whatever the type, our Centennial watch repair service can get you in and out with a fully functional watch. Silver Oxide batteries are the most common type. They are as small as M&M candies (not the peanut kind!) and there are two main forms. The first is secured in place using a spring-loaded arm. The top of the battery is very much visible, with just a small fraction of one edge hidden in the arm. The second form is the one that you’ll see in a watch case back. They are secured in place using cell straps. This strap is a delicate metal attachment sitting across the top of a watch battery. It is secured in place using small screws. While the overall idea is simple (just replace the batteries) it can be frustrating at best and downright impossible without the right tools at worst. Lithium batteries are becoming more popular in sports and digital watches because of its many features. You can easily spot a lithium battery because of their thinness and big size. They are being secured in place using a large latch strap to keep them connected in a battery plate. Also popular these days are rechargeable watch batteries. Rechargeable is always convenient. Actually, these batteries will also wear down through time. Rechargeable watch batteries come in different variations and are not easy to replace. Generally, the steps involved in watch battery replacement are easy, except for some types that require special tools and skills like that of our watchmaker. It all begins by taking off the back of the watch. Look for a small groove opening and insert a mini flathead screwdriver. Pop the back off of the timepiece. You’ll see a white plastic ring; remove it. Replace the battery with a new one and then return the plastic ring. Put the back of the watch on using your fingers. Press it down. You’ll hear a snap ensuring that the back is on properly. Remember that these are just some of the basic ways to do a watch battery replacement. A more detailed approach would depend on your brand and the age of your watch. Some watch batteries may require more work and materials. Use your best judgment. If you think you can’t handle it on your own, bring your own local Centennial watchmaker at Mauzie’s Fine Jewelry!